The photographs on this site chronicle the experience of a Devon farm as the shadow of the Foot and Mouth epidemic fell upon it in the spring of 2001. These photographs are not intended to be representative of the wide range of different circumstances that so many Devon farming families had to endure during that year. 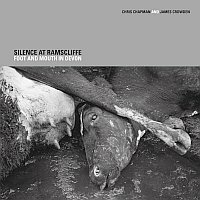 Instead they stand as a singular and - despite their harsh reality - an elegiac testimony of how life changed on this farm as the Devon countryside fell silent in the spring of 2001. For those whose lives were not directly affected by Foot and Mouth in 2001, the memories of the epidemic's impact may have already begun to fade. These photographs capture the sad picture of slaughter, of pain and of descending and consuming silence that so many farms experienced during the epidemic. They start with the everyday scene of cows being milked in the milking parlour: they finish with that same milking parlour left redundant and spotlessly clean - and a sheepdog in an empty farmyard with no animals to tend and nothing to do. A new book covering the Foot and Mouth crisis of 2001, with poems by James Crowden, was published by The Bardwell Press on August 18th 2005. "The work or documentary photographer Chris Chapman struck a much more sombre tone. He was with the West Country farmer Philip Lake when the killing team arrived to put down his dairy herd al the height of the Foot and Mouth outbreak. Mr Lake's cattle were not infected, but the disease had been confirmed in his cousin's farm across the road, so the herd fell victim to the now infamous policy of 'contiguous cull'. Chris Chapman's photographs shy away from the news and drama of building pyres; rather, the black and while pictures take their power from capturing very ordinary moments in the destruction of a farmer's life. 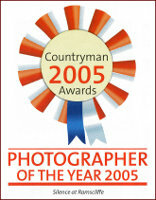 He is our Photographer of the Year for 2005."